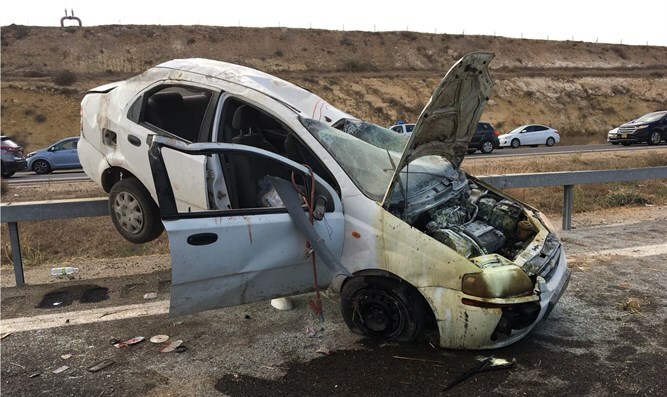 2 critically injured, 2 lightly to moderately hurt after vehicle overturns on Negev highway in deadly accident. A 22-year-old woman was killed when a vehicle overturned on Route 6 near Kiryat Gat in southern Israel Friday morning. Four people were injured in the accident, two of them critically, and two were lightly to moderately injured. Magen David Adom (MDA) paramedics rushed to the scene, where they were forced to declare the woman's death. They provided first aid to the injured and evacuated them to Soroka Medical Center in Be'er Sheva. The police reported that the road was not blocked for traffic. Drivers are asked to exercise caution and listen to police instructions. The circumstances of the accident are under investigation. MDA paramedic Josh Weinstein said: "This is a very serious car accident. The vehicle that was involved in the accident was with its rear part on the separation barrier, and the crushed passengers were lying on the road. We performed a quick scan and preliminary evaluation of the arena. A young woman of about 22 was unconscious, without a pulse or breath. We performed several medical examinations but she was without any signs of life and her death was soon determined." "The four additional injured were treated by large MDA teams in the area and were evacuated by MDA helicopter and intensive care units to Soroka Hospital, when their condition is severe and moderate, and they are conscious," he said.